James Inglis is a PhD student working on the project ‘Typewriters and Commerce in Scotland, 1875-1930’. This research is a collaboration between the University of St Andrews and National Museums Scotland. 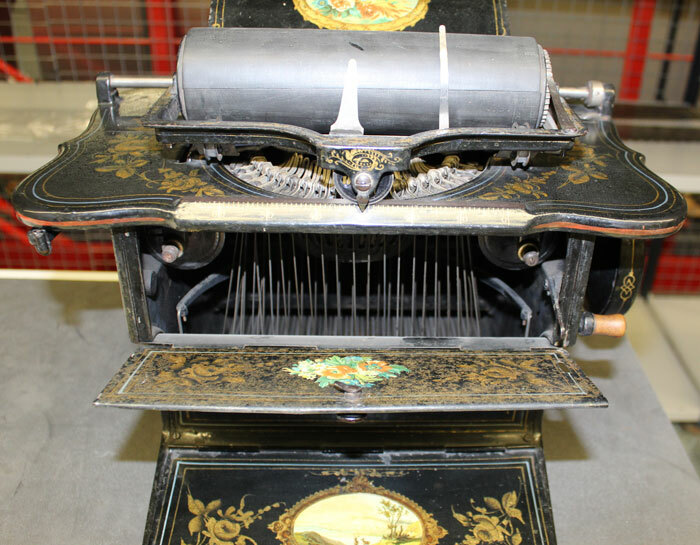 This new machine was the Sholes-Glidden Typewriter, developed by Christopher Latham Sholes, Samuel W. Soule and Carlos Glidden in the late 1860s and early 1870s. In 1873, American gun and sewing machine manufacturers E. Remington and Sons bought the rights to the invention and the following year the typewriter was put into commercial production. 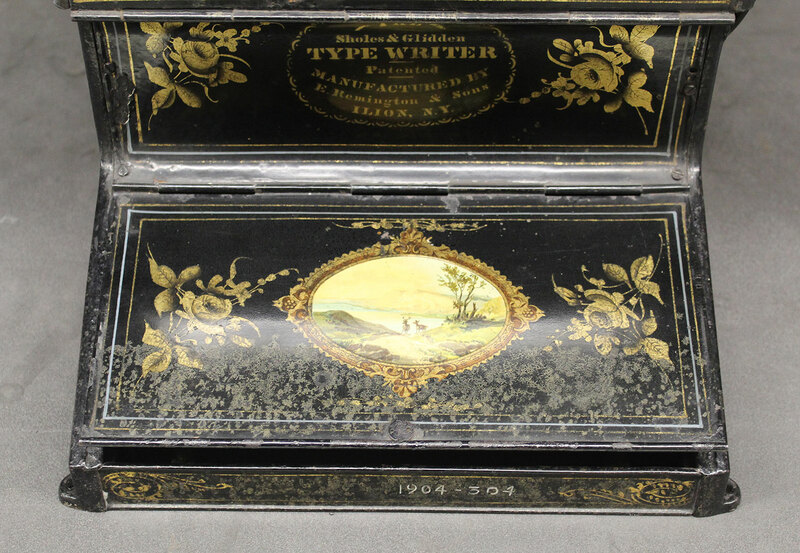 By the late 1870s, Remington began exporting a few hundred of its typewriters across the Atlantic, with the Sholes-Glidden achieving limited success in the Scottish market. Yet the early sale of the Sholes-Glidden in Glasgow and Edinburgh signalled the start of a rapid expansion in the Scottish typewriter trade that continued well into the next century. Recently, while exploring the typewriter collections at the National Museums Collection Centre in Edinburgh, I took the opportunity to take a closer look at the crown jewel in the Museum’s typewriter collection: a Sholes-Glidden Typewriter from 1875. The Sholes-Glidden Typewriter (left); with a close up of the manufacturing label (right). Later in 1904, Hadwen’s typewriting firm, Hadwen & Fleming, assisted with the appointment of a female typist to Inverness District Asylum, which at that time was in rapid expansion. 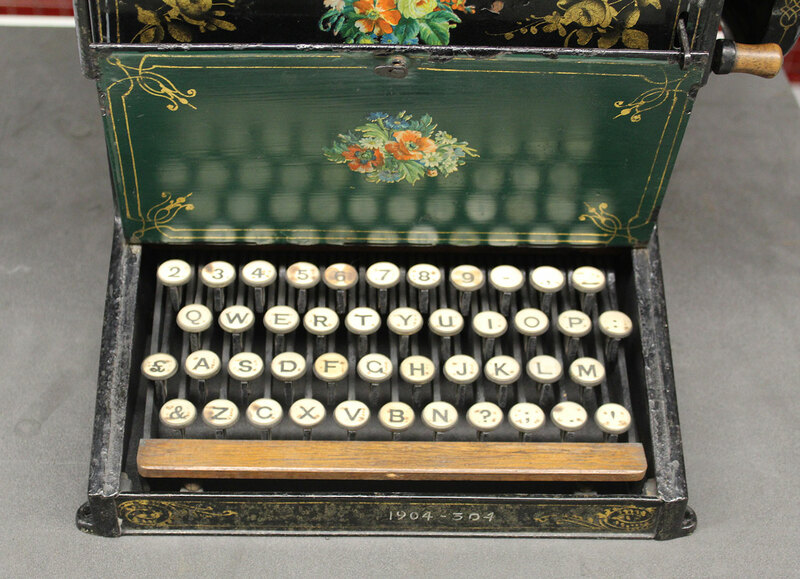 It is not certain why Hadwen donated this typewriter to the Museum; but by 1904 the Sholes-Glidden would have been decades out of date and quite unsuited for use in Hadwen’s chain of typewriting offices. 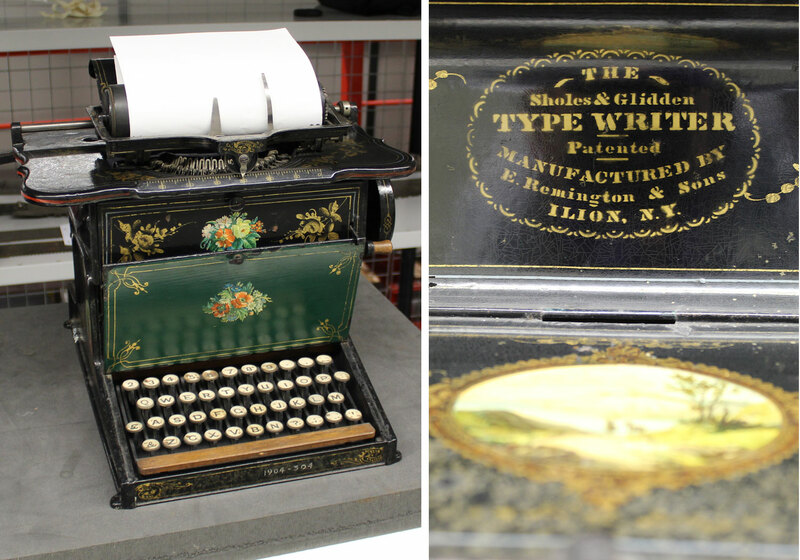 What is clear is that the Sholes-Glidden is not only of historical significance, but it has a beauty that is unique among typewriters then and now. The aesthetic quality of the Sholes-Glidden would surely have been a major consideration of Hadwen’s when donating the typewriter and a key motivation for the Museum to acquire it. The beautiful patterns and illustrations that cover every surface of the Sholes-Glidden were also the first thing I noticed when investigating this typewriter. The design is reminiscent of contemporary sewing machines, which is understandable considering the Sholes-Glidden was developed in Remington’s sewing machine works. The first typewriters even came with a pedal for returning the carriage which closely resembled the trestle on a sewing machine. However, by the time this model was released the pedal had been replaced with a lever for returning the carriage. Now the machine could be transported without the added expense of a cast iron stand. However, at 13.5kg it could still hardly be described as portable; a fact I can testify to from my experience of lifting this hefty machine! Two images showing the lever for returning the carriage on the Sholes Glidden. 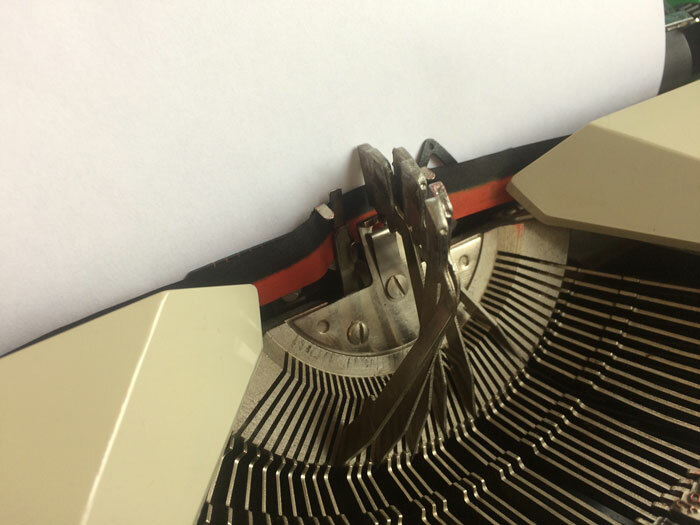 Lifting the cover at the foot of the typewriter reveals perhaps the most significant design feature of the Sholes-Glidden: the QWERTYUIOP keyboard. Today the QWERTY arrangement has become second nature to keyboard users in the English-speaking world. Yet in the 1870s this apparently random arrangement of letters was a practical solution to a technical deficiency of the Sholes-Glidden typewriter: the problem of type-bar clash. The beautifully decorated keyboard cover which reveals the QWERTY arrangement. Lifting the roller (or platen) reveals the circular arrangement of 44 type-bars known collectively as the type-basket. At the end of each type-bar a letter, number or symbol is cast in relief. 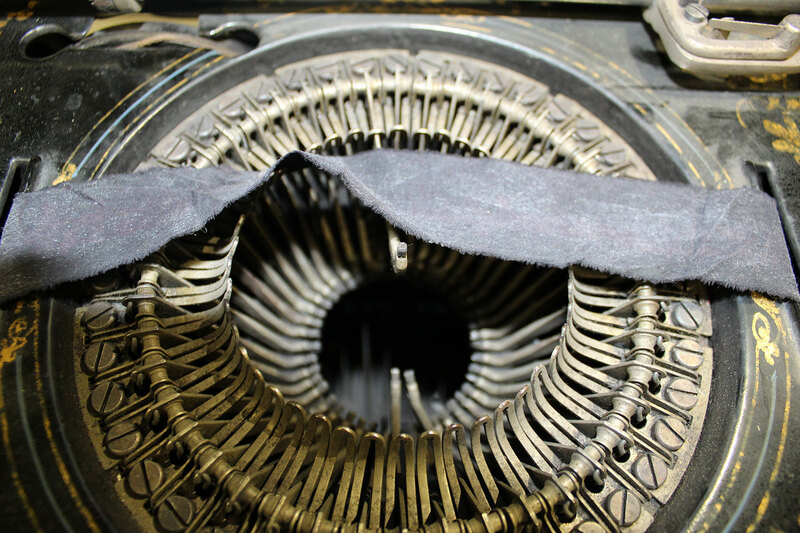 Upon pressing a particular key, a system of wires pulls the corresponding type-bar upwards, out of the type-basket so that it comes into contact with an inked ribbon directly beneath the underside of the platen, around which the paper is wrapped. The pressure of the type-bar through the ribbon leaves an imprint on the paper and thus… the character is formed! Lifting the platen on the typewriter (left); circular arrangement of the type-bars, with the ribbon in place (right). Raised type-bar with letter cast in relief (ribbon moved aside for demonstrative purposes). System of wires inside the typewriter linking the key levers to the type-bars. The following film from British Pathé starts with a 15-second sequence of a Sholes-Glidden in full operation. The video demonstrates the basic features of the typewriter as well as the necessity to lift the carriage to see what had been typed! While the film was released in 1950, the operator is wearing Victorian dress that is contemporary with the Sholes-Glidden Typewriter. The typing system all works perfectly until two adjacent type-bars are actuated in quick succession. In many instances, the result is a type-bar clash. Any further operation of the keys results in the top letter in this mash of type-bars being continually pressed against the paper: another lesson I was quick to learn in my early experiments with typing. Example of type-bar clash on my own Maritsa 30 typewriter from the late 1970s. The solution devised by Sholes was to rearrange the letters in the type-basket so that commonly occurring letter pairs were at either side of the type-basket. 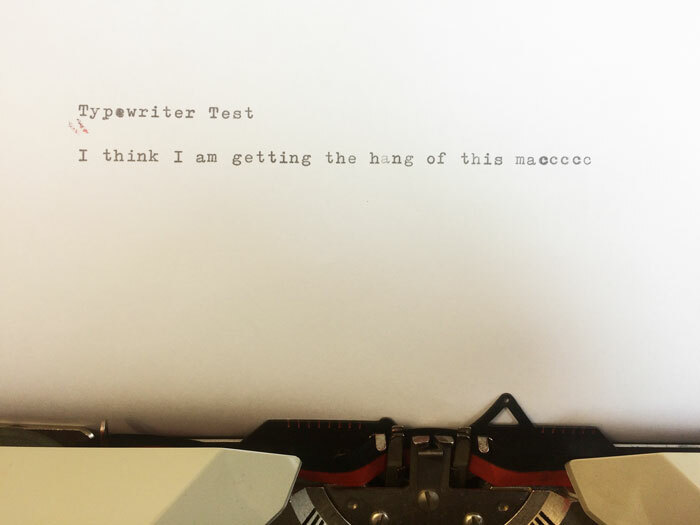 To investigate this further, I had a look inside the typewriter to see where each letter in the type-basket is arranged in relation to the keyboard. By pressing each of the keys and recording the position of the type-bar it raised, I was able to sketch out the relative locations of each of the type-bars in the type-basket. This was a slow but necessary process. 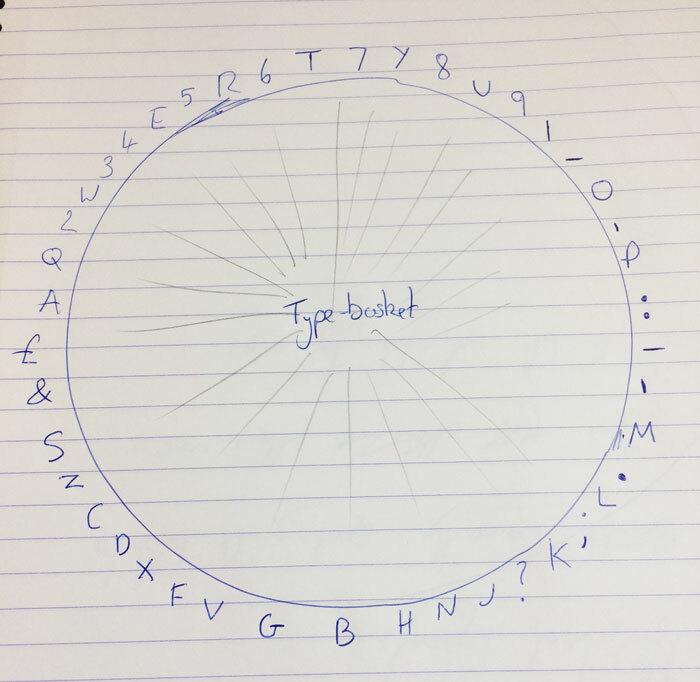 As we can see from the diagram the order of the letters in the type-basket does not correspond with each row of the keyboard. My rough sketch of the arrangement of type-bars inside the Sholes-Glidden. Looking more closely at the arrangement of the type-bars we can see that alphabetical letter pairings such as S and T are placed on either side of the type-basket. Vowels, which are generally used more frequently, have been moved away from the main groupings of letters altogether to further decrease the likelihood of type-bar clash. Despite Sholes’ unusual arrangement, the original alphabetical layout of the keyboard can still be discerned. This can be made out from the diagram above, however, a quick look at the middle row of your own keyboard will show this even more clearly. Bar the vowels, letters D across to L are in precise alphabetical order; another remnant of the Sholes-Glidden typewriter that still lives with us today!